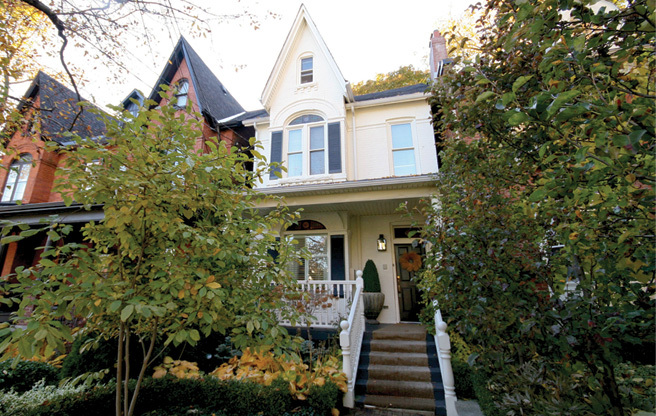 House of the Week: $1.6 million for an interior designer’s Casa Loma Victorian – "I KNOW TORONTO!" $1.6M doesn’t seem like a huge stretch for a detached home with four bedrooms, four bathrooms and a home office – especially one that’s owned and decorated by a recognized designer! THE PLACE: A facelift on this detached Victorian in the so-called Republic of Rathnelly allowed its classic details—plaster crown mouldings, ceiling medallions, panelled walls and stained-glass windows—to shine. BRAGGING RIGHTS: The current owner is interior designer Colleen McGill of McGill Design Group, a regular in Canadian House and Home and on HGTV. She decorated the place herself, natch. BIG SELLING POINT: The huge third-floor office will make you yearn to work from home. Think cathedral ceilings, a kitchenette with a built-in Miele espresso machine, a private bathroom and French doors leading to a rooftop deck. POSSIBLE DEAL BREAKER: This house has neither garage nor driveway, so you’ll have to settle for permit parking on the street.